After purchasing the Martha Stewart acetate border stickers, I wondered what the best use would be for the adorable snowmen, trees, snowflakes, and words. 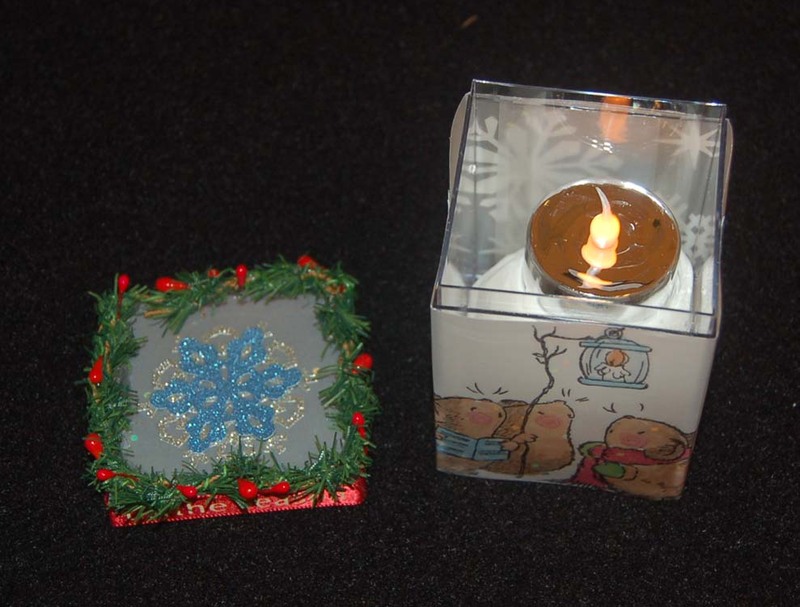 I happened to have some clear acrylic 2" boxes that I was planning to use for Hearty clay shaker ornaments. What if I put the stickers in the boxes and added snow? Eureka! I started by putting flattened balls of white Hearty clay behind the snowman. I let this dry completely (moldy snowmen just wouldn't be right). 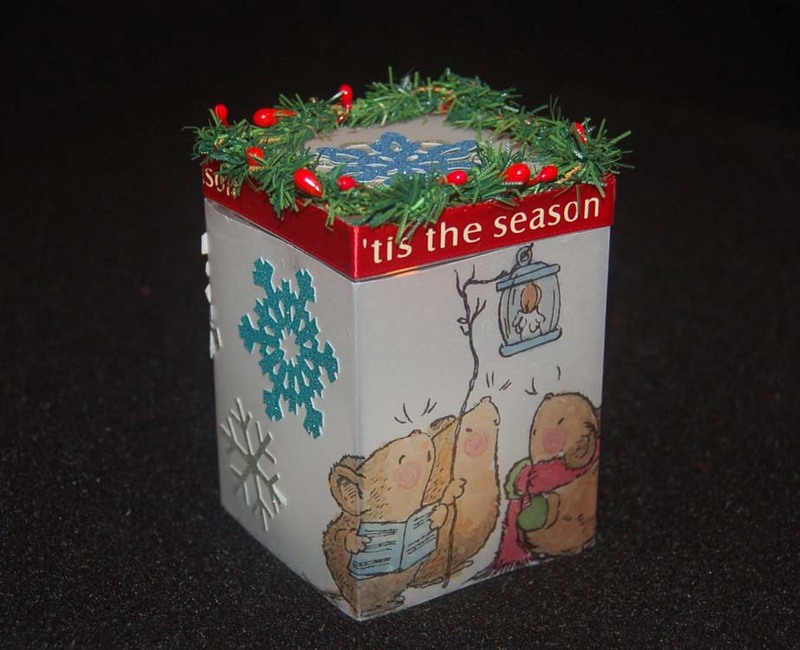 Next I cut out a piece of double-sided snowflake printed paper to fit inside the box and tacked it down with tiny dots of Fabri-Tac glue in the corners. Next I put a tree sticker in the background and a snowflake on the outside of the box cover. I trimmed around the words and adhered it to the cover also. The dried Hearty clay snowman was glued inside the box and white Flower Soft and some MS snow glitter was added before closing the shaker box. 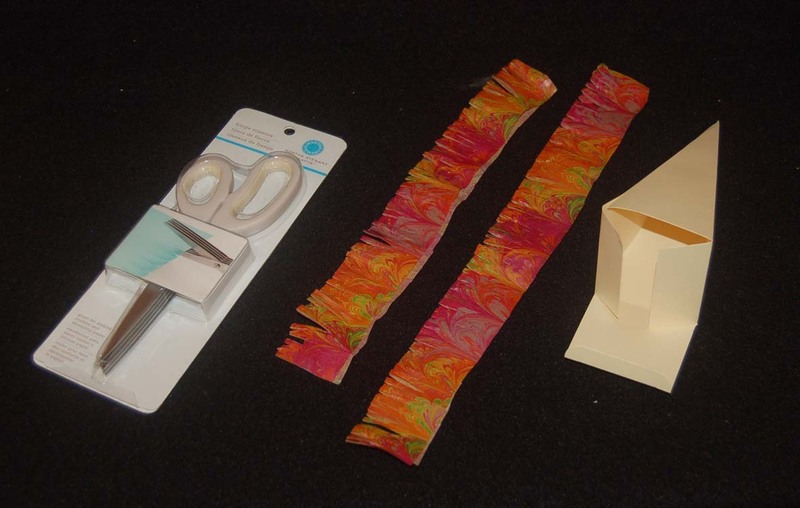 I glued 3/8" ribbon around the box sides and formed a loop on top. 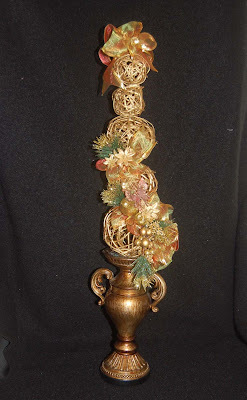 The ornament was finished off with a bit of miniature holly garland. The cap on the snowman with ear muffs was made by curling a piece of pipecleaner and gluing a teeny jingle bell to the tip. I discovered that the Martha Stewart border strip package also contained a piece of adhesive backed light blue paper but when I placed it in the box the adhesive showed through the clear box so I covered the back with another decorative paper. This actually makes it easier to write on if you want to give this ornament as a gift tag. 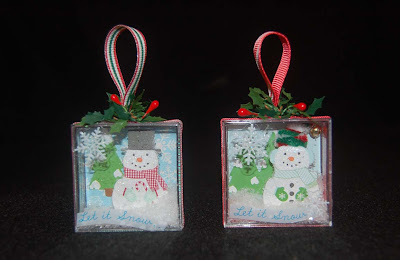 Well, I hope this explanation was clear enough for you to try to make these simple ice cube tag /ornaments. 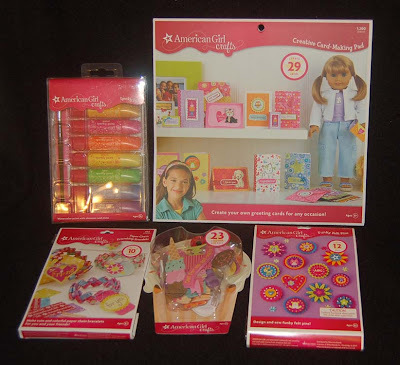 If time permits I will write up the instructions and post it on our Ben Franklin Crafts website (http://www.bfcraftclub.com/). 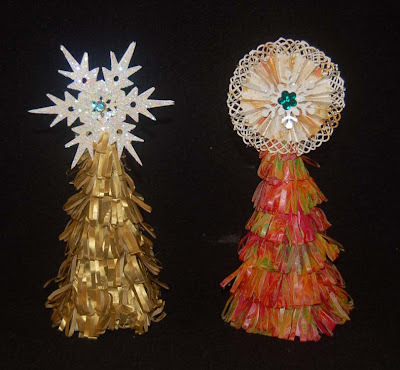 If you didn't get to the Hilo Christmas Craft Fair at the stadium yesterday, you still have a chance to get some wonderful handmade crafts today. In the photo above, Margaret from the Hilo Ben Franklin Crafts store proudly displays her handcrafted items for sale. She is selling beautiful jewelry and paper crafts for very reasonable prices. 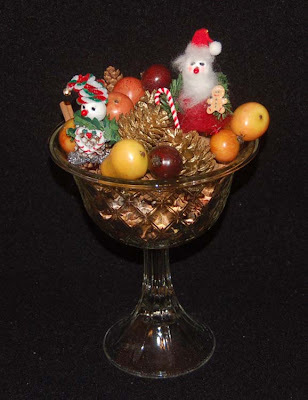 The topiary below is one made by Donna who always does the beautiful wreaths and Christmas decorations at the store. Sorry folks the one in the photo is mine, but she has lots of other gorgeous decorations. 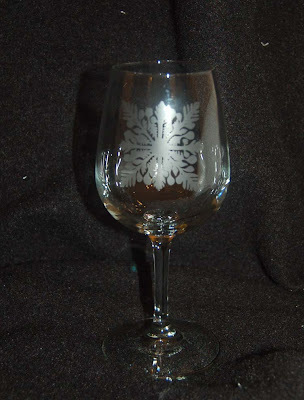 The etched goblet is from a set made by Denise (also a BFC employee). 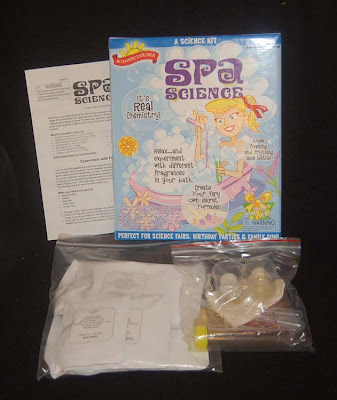 I couldn't resist getting the set because it was such a bargain and I know someone who will love it. 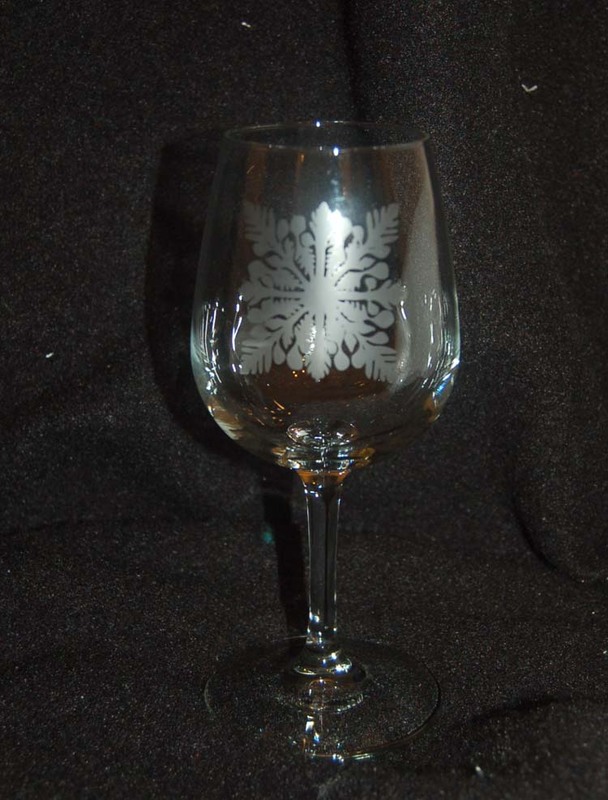 Don't worry Denise has lots of other sets and etched glassware for sale. Besides the crafts made and sold by the Hilo Ben Franklin Crafts employees, there is a great variety of merchandise available for smart shoppers who know that a handcrafted item makes a great one-of-a-kind gift. 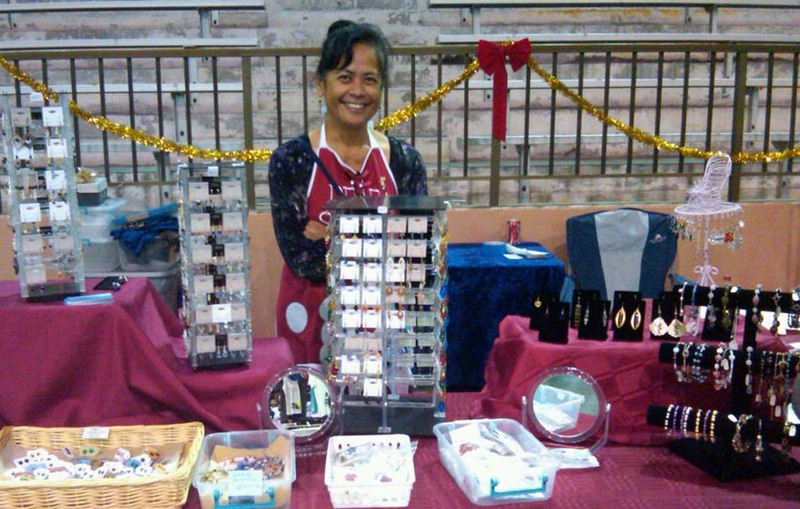 You won't be disappointed if you hurry down to the Hilo Christmas Craft Fair today! Are you wearing your after Thanksgiving smile? Satisfied? Glad all the cooking and cleaning are done? Caught up with all the family news? Okay then, get a good night's sleep and prepare for the best shopping day of the year! 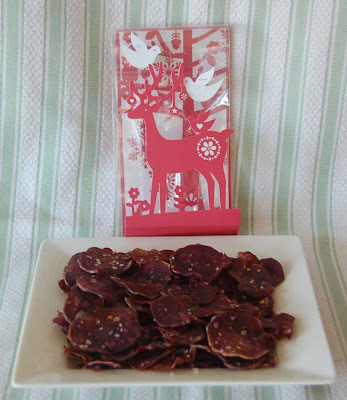 In a few hours the Early Bird specials at Ben Franklin Crafts will begin. 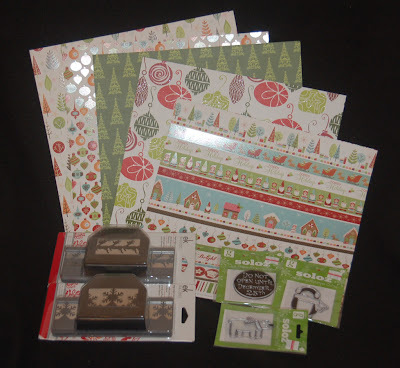 Not only is there a 40% off coupon for one item (make it a big one), there are unbelievable savings on Sizzix dies and Martha Stewart Christmas punches. They're 35% off!!! 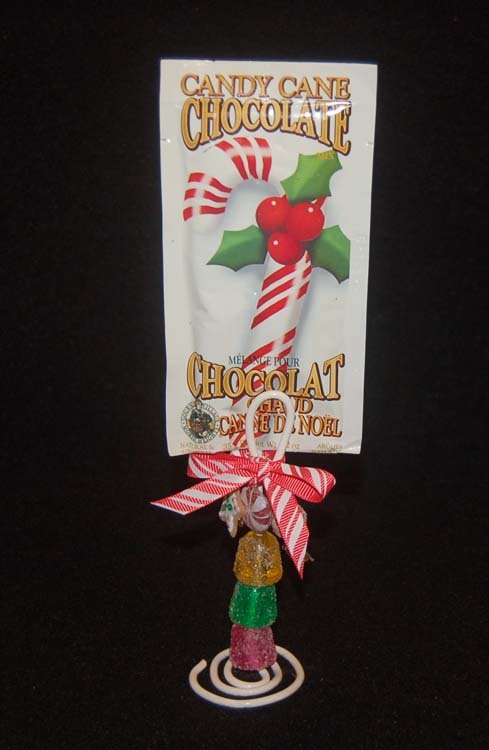 Don't forget to go to the Annual Christmas Craft Fair at the stadium in Hilo tomorrow and Saturday. It's sponsored by Ben Franklin Crafts and sure to be a big one with a sell-out of booths.....71 vendors! If you still have energy for shopping Friday night, you can go back to Ben Franklin Crafts to use the late bird 40% off coupon and purchase all the other sale items. As usual, I feel grateful this year for the health of my family and friends. I am glad that life has given me connections with so many kind-hearted people and that these relationships continue to grow stronger. 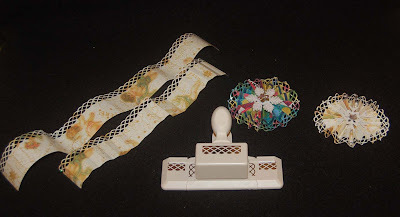 Recently, through the marvelous beauty of blogland I met a new friend Shirley N. (http://www.stampinforthefunofit.blogspot.com/). She is one of the thoughtful readers of my blog who recently sent me a lovely thank you gift. It was a surprise and a joy especially because it was accompanied by a handmade card. 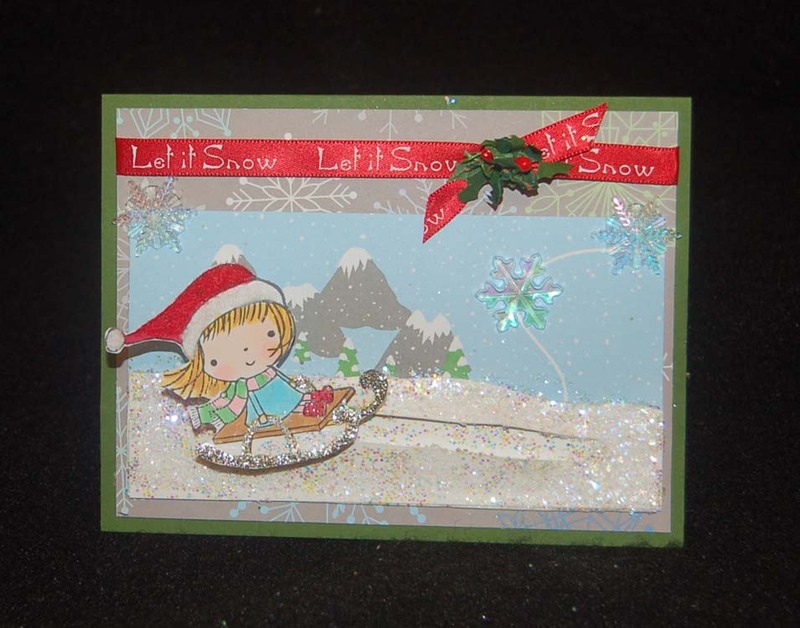 Shirley is really a talented card artist and I am so honored to have one of her creations. 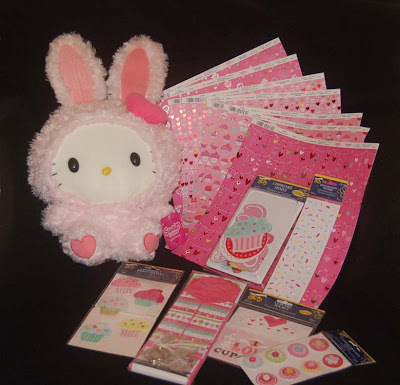 (See the photo of her card and the sweet gifts she sent.) Thank you Shirley for being so generous. Thank you also to all of you in blogland who support my blog and so thoughtfully take the time to send me a comment. I appreciate each and every one of you! 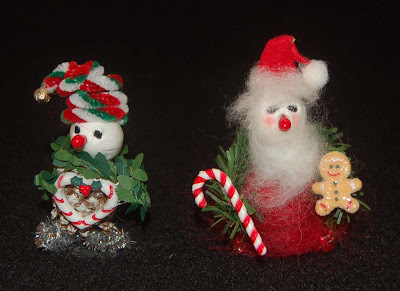 Every year I am thrilled by the sweet Christmas ornaments and decorations available at Ben Franklin Crafts. 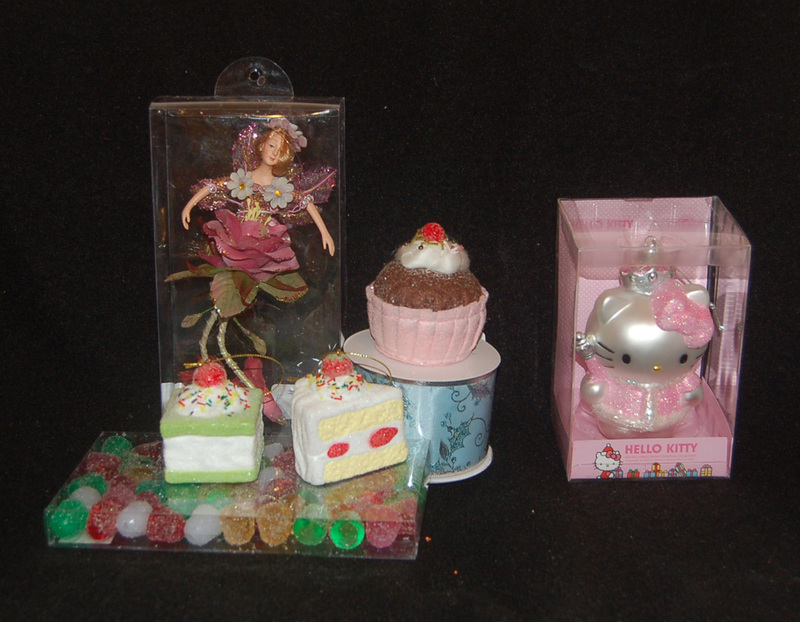 I purchased the Hello Kitty ornament awhile ago and so I can't guarantee that the store still has them in stock. 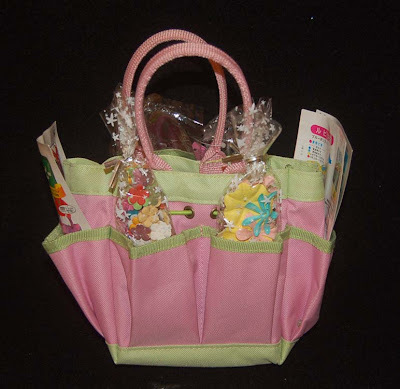 It is so adorable and seems to match well with the luscious, good-enough-to-eat artificial pastries and candies. This year again we have a fabulous collection of holiday ribbons and magical fairies. Although not pictured here, the store does carry a fantastic assortment of glittery foliage and wreath-making supplies. I really must take a photo of the beautiful decorations at the Hilo store.....Oh gosh, the trees belong in a fantasy world or at least at the White House. Go take a look at the stores to get inspiration and add to the glamour of your home this holiday season. Most of the hard working staff at the Ben Franklin Crafts Hilo store will tell you that my hobby is not crafting....it's shopping! I don't think I've ever shopped at BFC and left empty handed. Sometimes the cashiers will be surprised that I didn't buy too much but I laugh and say that it's the third time through the checkout line that day LOL! 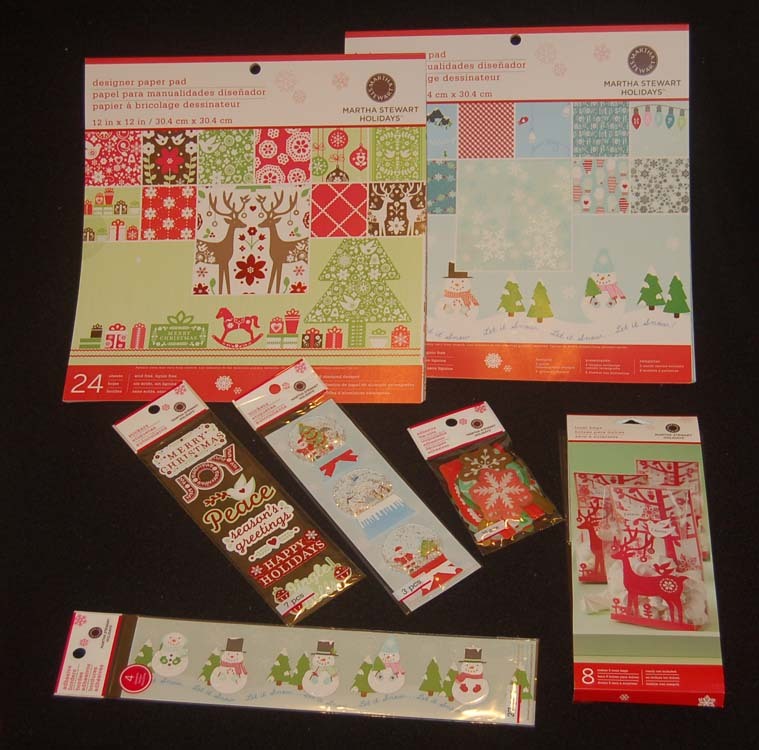 Especially at this time of the year the stores are humming and there are so many fantastic products at Ben Frankllin Crafts. 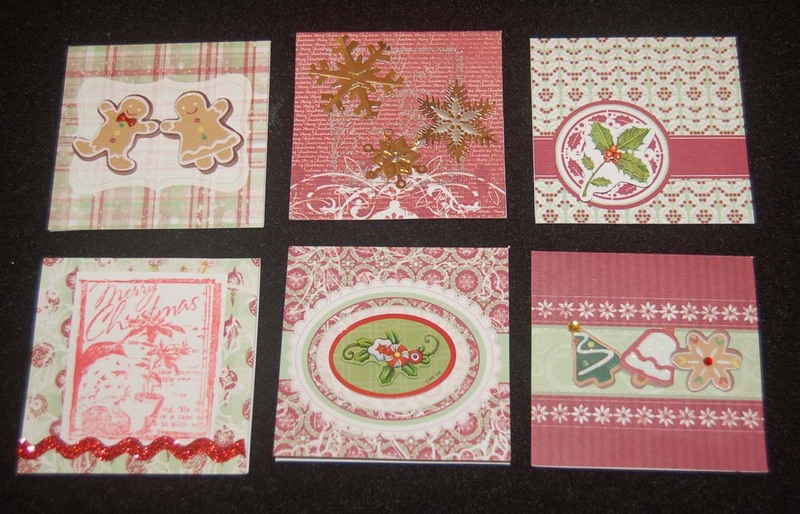 In the photo above are just a handful of the beautiful 12x12 two-sided papers from Imaginisce, new Christmas border punches from EK Success and G Studio stamps (large Xmas designs) for an amazing $1.25 each! 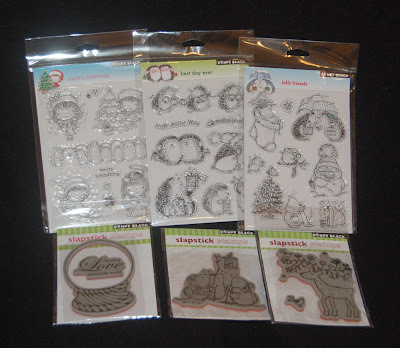 Awhile ago I bought some terrific Penny Black clear stamp Christmas sets. I debated about which ones to buy but now I'm glad I didn't wait because there are just a few left in the stores....better hurry if you want to purchase some of the cutest stamps of the season. Now would be a good time to become a Ben Franklin Craft club member if you aren't one already because you'll save 10% on every purchase even items on sale! Okay, enough blog surfing.....go shopping and then craft something special for someone special. 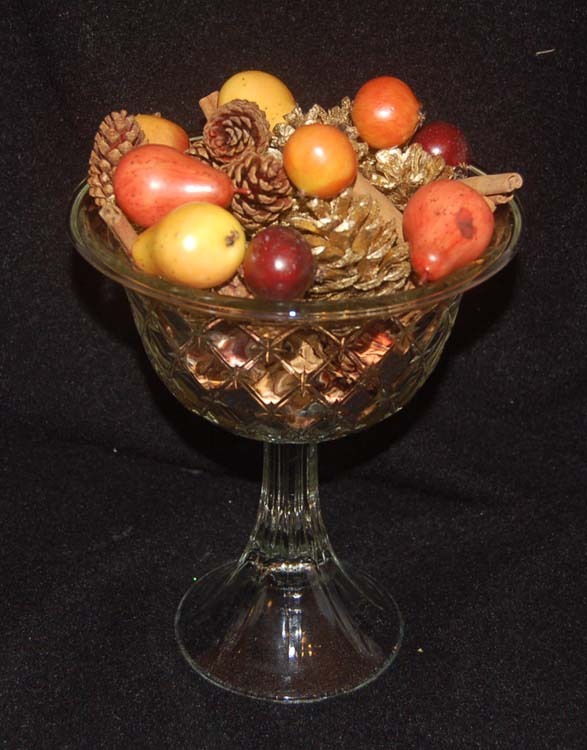 I was fiddling with the leaves and acorns that were the punched out pieces from my border punch. I thought that they would be cute in a shaker card. With a stamped and colored image of 'Cocoa Emma' and a forest stump with mushrooms, I created a card which to me represents the calm before the storm of Christmas festivities. 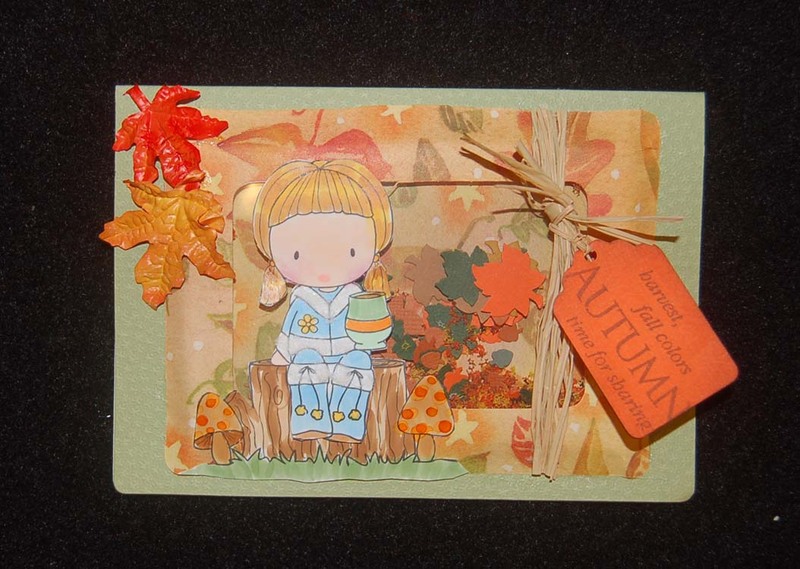 Some artificial leaves, raffia, and a message stamped tag finished off the autumnal card. (Oh yes, a Martha Stewart glue pen and white Fun Flock helped to dress up Emma's snowsuit.) Although you can't really see it, there is also some (autumn) Flower Soft in the shaker for a crispy leaf sound and texture. 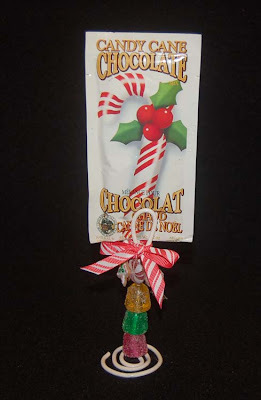 Make a card like this and include a packet of cocoa mix (from Ben Franklin Crafts). 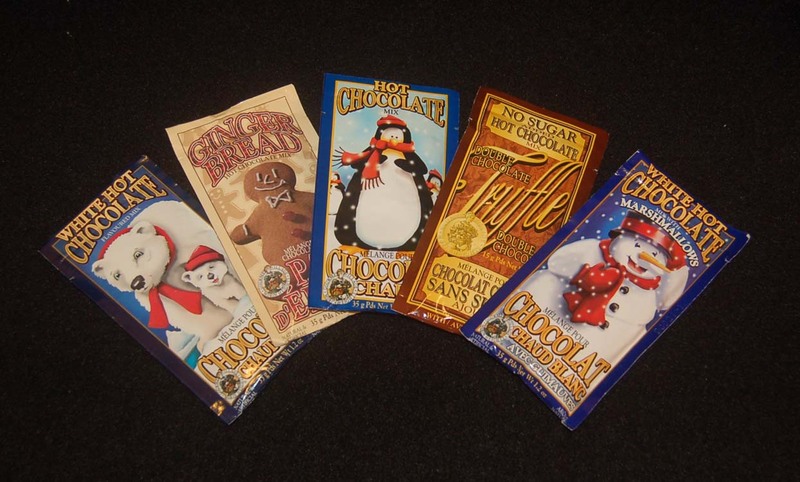 There are lots of pretty packages and tasty flavors to choose from....even a sugarless one! They would also be perfect for tucking into stockings and Christmas cards or for party favors. I wish all of you a calm, safe, yummy, friendship-filled Thanksgiving holiday. Relax this Thanksgiving....... here come's Christmas!!!!!!! 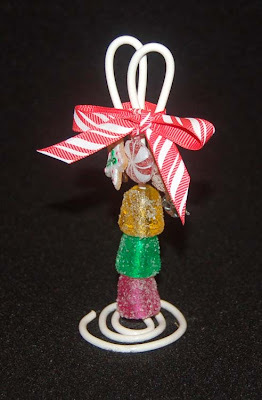 I've always felt that when the Christmas season rolls around we all go into a frenzy making or buying little gifts for all those who do service for us all year and the recipients are overwhelmed by all the treats and knickknacks. 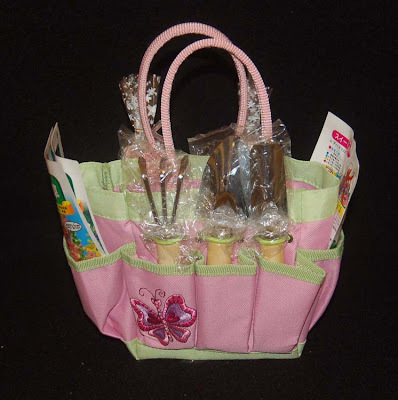 Why not give Thanksgiving gifts to those teachers, secretaries, mailmen, etc.? Afterall the gifts are meant as a way to say thank you. 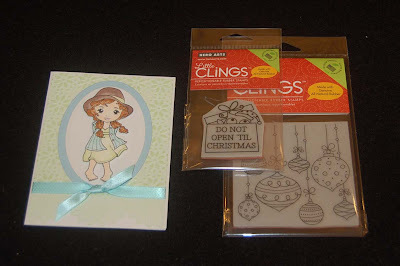 Presented here are simple gifts that won't break a tight budget. They start with the plain Sierra Pacific journal with pen or undecorated swivel note pad (an amazing $1.00 each). While tidying up my craftroom I came across two pieces of handmade paper that were too good to throw out but had foxing spots and bug holes (from hoarding them too long LOL). 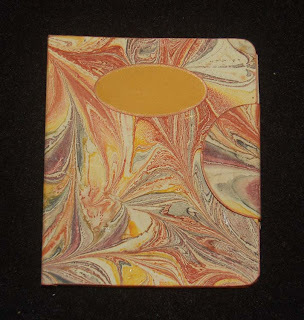 The marbled paper is of good thick quality so it is forgiving when adhering it to the snap-closed book. I used wide pieces of Merikan tape to stick the paper to the cover. 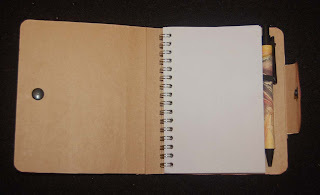 If you trim the paper with just a margin as thick as the cover you can use Fabri-Tac to glue the paper over the edge and you can further embellish by rubbing ink on the finished edge. At first I was going to stamp or write in a title on the oval label but I decided to leave that for the recipient to decide. This swivel note pad is really cute and easy to cover. 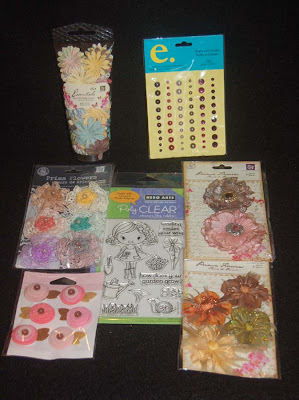 If you start with an interesting fiberous paper you really don't have to do any more embellishing but you can. To cover the aging flaws of this once beige washi paper with plant inclusions, I sprayed it with some autumn ink colors. Simply hand cutting the paper leaving a slight margin and gluing with Fabri-Tac made the project an under 10 minutes quickie. I tried using the Merikan tape but the fiberous nature of the paper made it peel off too easily. 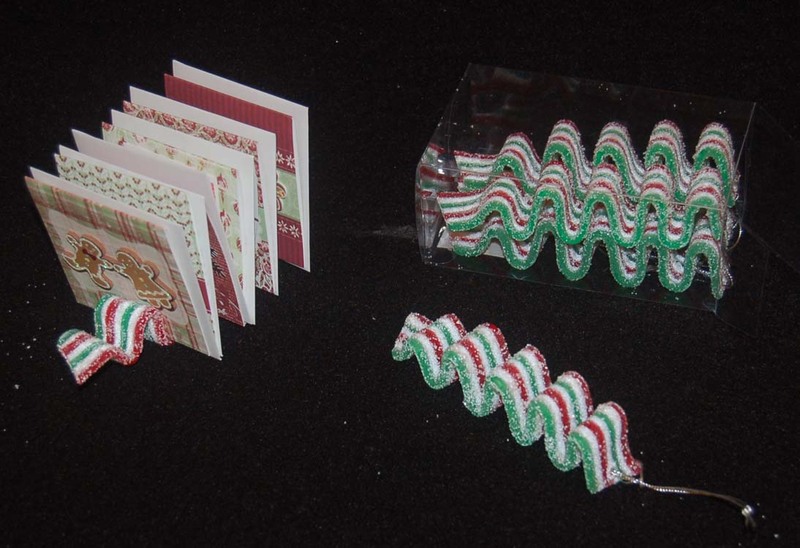 Fabri-Tac glue works perfectly for this project because it dries quickly without warping the paper. You might want to make a deccorated pen to go with the note pad. Ben Franklin Crafts sells all of these Sierra Pacific products for your ' Thanks for Giving' gifts. Thanks for reading this post. Please come back soon for other holiday ideas. Making placecards for the big Thanksgiving feast seems like just one more thing to do at an already hectic time, especially when everyone nowadays grabs a paper plate and gathers around the T.V. to watch the game. However, I have found that guests really like seeing their name in print on a pretty keepsake arranged around the table. 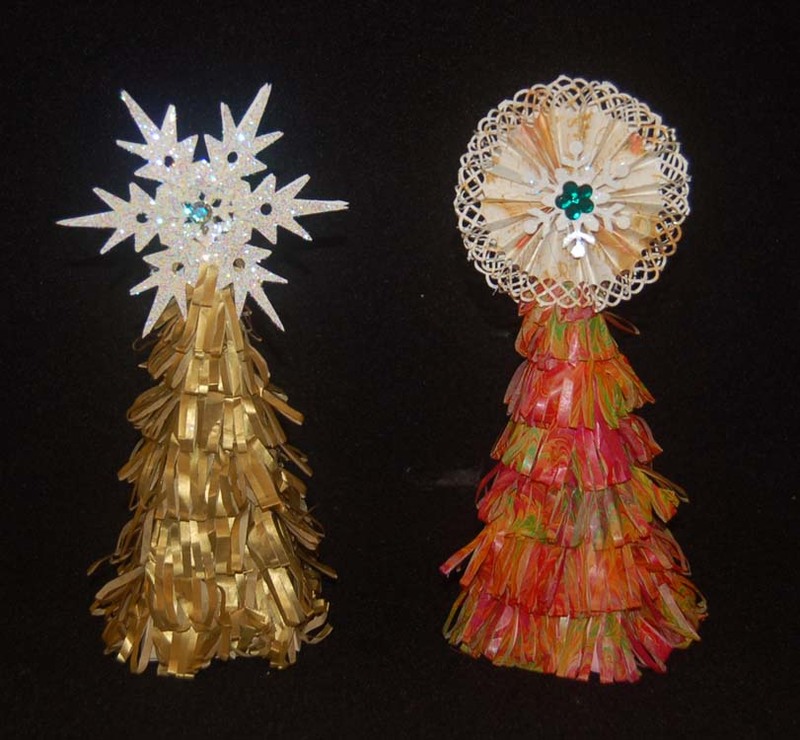 It doesn't take more that a few minutes to do simple ones like the top two shown here. 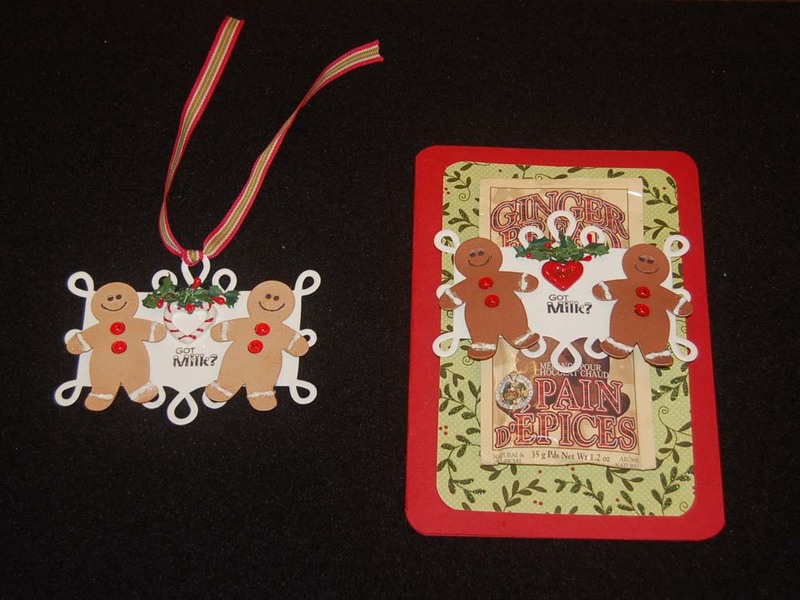 They are just a folded pieces of cardstock with a label and leaf sticker (left) or die-cut labels glued onto wide decorative ribbon. The bottom two placecards have room for a photo and a name. They were made fancier by cutting a half circle on the back of the card next to the fold. I used the Coluzzle system but you could just trace a jar cover with an craft knife to make the cut. Stickers/artificial leaves and embossed sayings complete the placecard. 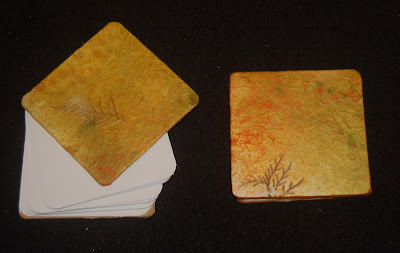 Rubbing the edges with gold or copper ink gave them an antique look. 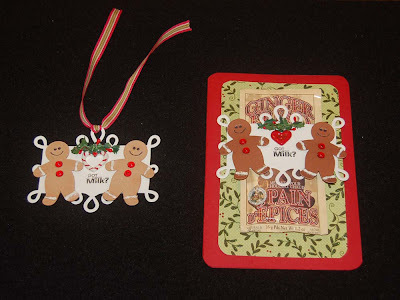 After Thanksgiving you or the guests can use the placecard to embellish a scrapbook page...hey that could be an activity for non-sports-watching guests. 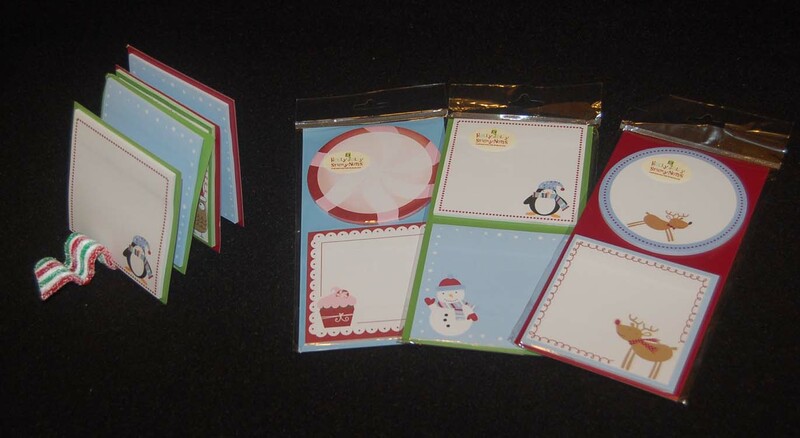 In fact, making the placecards could be a good way to keep the kids busy while you are cooking. 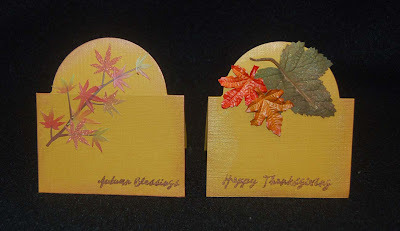 I hope this entry has given you thoughts about why it is an excellent idea to invest some time in making placecards for Thanksgiving this year. Have a good Gobble Gobble Day! Wait! Was there a contest? Well, yes and no. No , there wasn't an official contest but yes, there was a secret contest going on all year. As usual at this time of the year I start thinking about all the things for which I am grateful. I thought about how thankful I am for all of you who take the time to read and comment on my blog and decided to make a contest for you. I went over all the past year's comments and counted each one to determine who were the most helpful by giving me feedback. Okay, enough already....... who won? Cheryl (Life is Sweet) is the big winner. 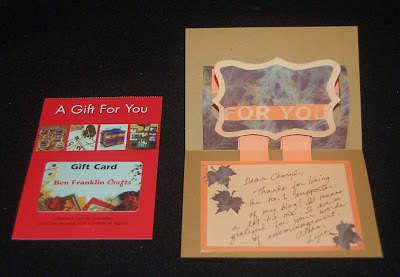 I will be contacting you, Cheryl for a mailing address so I can send you a Ben Franklin Crafts gift card and some craft goodies. Three other winning blog visitors who left lots of terrific comments are Kris (K-Lusive Kreations), Janis Kamimura (Creative Expressions), and Shirley N. (Stamping for the Fun of It). 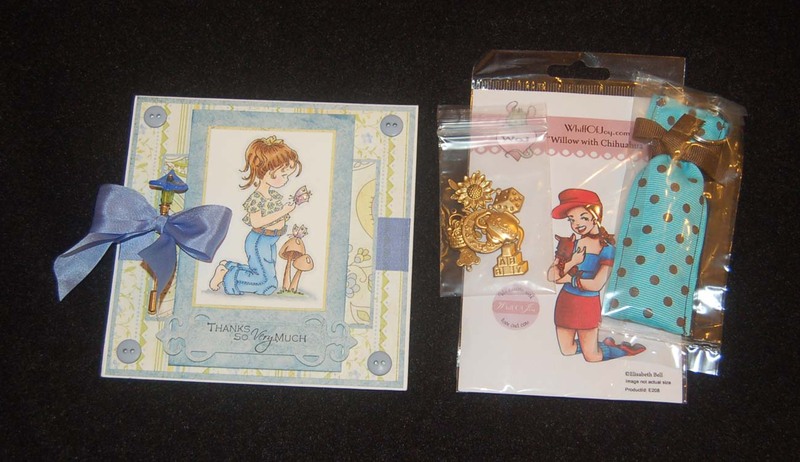 I will write you a blog comment to obtain your mailing name and address so I can get prizes to you too. Thank you to everyone who took the time to visit my blog. I am very thankful for your interest and hope that I've given you something interesting to read in return. Now is the time for crafters to crank out those gifts and craft sale items. To me the easiest and most economical ladies' items to make are earrings. In comparison to necklaces and bracelets, earrings require a minimal amount of supplies and time. Here are three examples (click on the photo to enlarge the image) that I whipped out in one sitting (1-2 hrs.). The eliptical pair on the left simply required jump rings to link together the two components. The earrings with the green peridot beads were a bit more work and used 26 gauge gold filled wire to attach the bead to the square wire frames and teardrop filigree dangle. In the center is the earring that took the longest to assemble. Finding just the right size of garnet to fit in the triangle sterling silver frame and wiring it on with wire added a perfect touch of color. 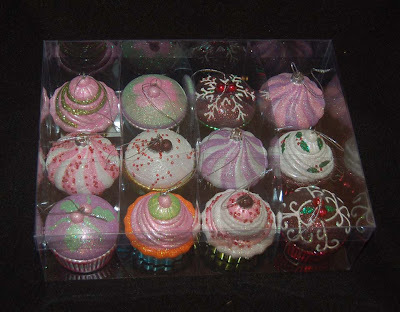 (For earrings try to use sparkly or bright colored stones, which although small will catch the eye.) Of course the silver earrings could have been left plain or just adorned with a teardrop pearl. 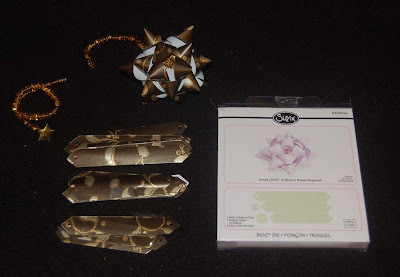 For gifts and craft fairs I think that you should make your earrings with gold filled or sterling silver components because for just a bit more cost you will upgrade your work tremendously. 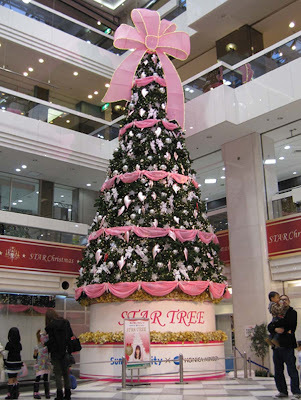 Remember Christmas is a time when everyone likes to splurge and give the best that they can afford. Okay, get crafting! I was just planning to test out my new EK Success leaf border punch, but somehow I ended up making a card. 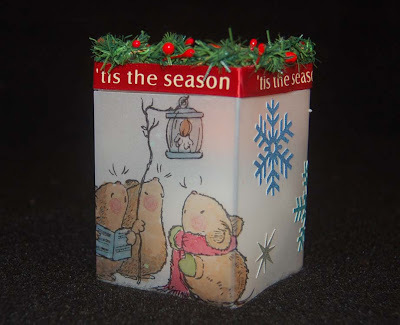 It started with the punched border which didn't stand out on the card so I taped an autumn leaf glittered gauzy ribbon on the inside of the card so that it would show through the punched design. 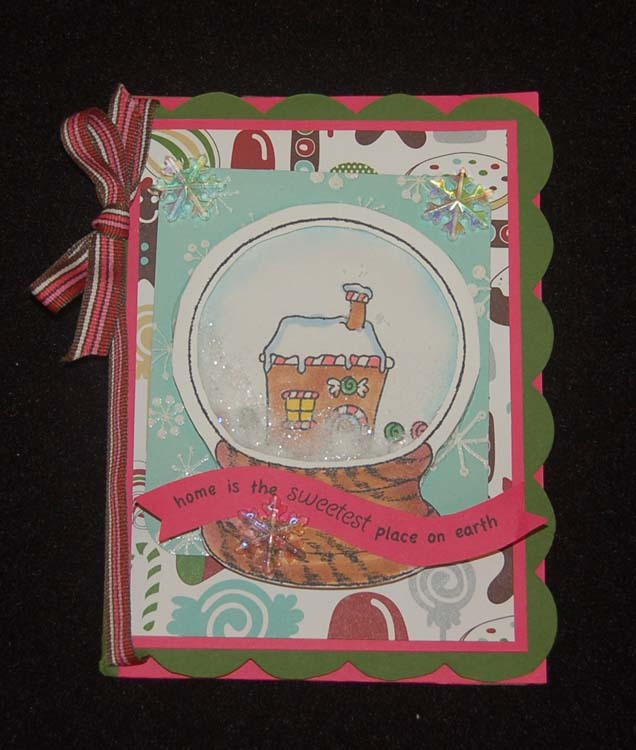 Next I used some metallic inks and stamped leaf designs above the punched border. 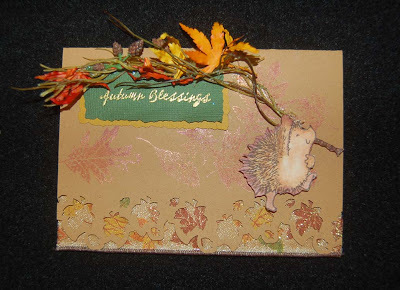 That didn't get the effect that I wanted even after I added the gold stamped and heat embossed words 'Autumn Blessings'. When I glued on the piece of mini autumn leaf garland, the card looked more complete, but it still needed something. 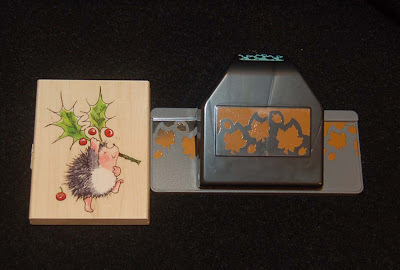 Because I had just purchased the Penny Black wood handled Christmas hedgehog stamp, it was on my desk and for some reason I could visualize it on the card. After stamping the image on white cardstock, coloring and cutting it out (removing the holly branch), I glued it on to the card with Fabri-Tac. I'm really pleased at how this card evolved and became something better than I imagined....and to think it all started with just testing out a paper punch. Playing with your craft tools and supplies is probably the best way to create something new and unique. (The photo below shows the stamp and punch that I used.) I hope that you've enjoyed reading this post and will return to this blog site often for inspiration and ideas. Thank you for visiting!